This weekend, Michael Schumacher will be starting the Spanish Grand Prix for the eleventh time. Without a doubt, Spain is one of the most successful venues the German has driven. This is a tale of ten starts, ten points finishes, seven podiums and yet only two wins. After having made his debut with Jordan at Spa-Francorchamps, Benetton quickly grabbed Schumacher and at the subsequent races at Monza and Estoril, he proved the fuss around him was justified by scoring three points in his second and third races ever. When his fourth Grand Prix weekend started at the Catalunya circuit, Michael Schumacher was already well on his way to become a force to be reckoned with, especially for his teammate Nelson Piquet, whom he had beaten in qualifying on both previous occasions. On Friday, he made a convincing start, being the first behind the Williamses and McLarens in free practice. In the first qualifying session, the position didn't change, but instead of being 0.7 seconds behind the fourth placed driver and 1.5 seconds behind the leader, Schumacher now was immediately on the tail of the car ahead, Riccardo Patrese's Williams. In Saturday's free practice he managed to improve a place, but that was only because Patrese's Williams developed technical problems. In qualifying during the afternoon, a large group was in the mid to high 1:20s. Ivan Capelli was fifth in the Leyton House March, with 1:20.584, and Schumacher concluded the group with a time of 1:20.779. 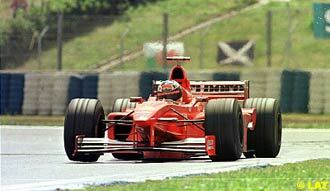 Even though the gap was less than two tenths of a second, Schumacher only classified 12th in the session. Luckily for the German, this didn't have any consequences and the track was quite a bit slower than the day before. As Sunday morning arrived, so did the rain. The warm-up was driven in full rain and Schumacher only set the 11th best time. By race-time, Schumacher's fifth position on the grid proved to be rather good, as the entire left side got off the line a lot better than Mansell, Patrese and Prost on the other side. Schumacher moved up into third, behind the McLarens of Gerhard Berger and Ayrton Senna. 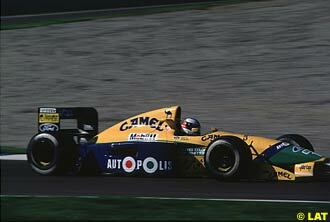 However, the Williamses were a lot better than Schumacher's Benetton, and Nigel Mansell quickly made his way back past the German. As Mansell battled his way past Senna, Schumacher was the first of the top six to come in and change from slicks to wets when the rain started falling again. Schumacher resumed in 13th, however after everybody else changed to slicks, some six laps later, the German was back in third, now behind Berger and Mansell. Alas, it didn't last. After 20 laps Schumacher spun and dropped to sixth, ahead of Nelson Piquet. After a battle with JJ Lehto, Jean Alesi and Riccardo Patrese, Schumacher eventually ended up in the same sixth place. With three points finishes in three starts for Benetton, this was a pleasing result nonetheless. In 1992, the Spanish Grand Prix was held earlier than usual in the season. Now held in May, as the first European race of the season, this was also the first Grand Prix for Schumacher and Benetton with the new B192. Schumacher started the weekend well. In the first practice session he was third, behind the Williamses of Mansell and Patrese, who were already regarded as unbeatable. A better reference point was Ayrton Senna. The Brazilian was fourth, nearly a second slower than Schumacher. If this didn't convince the Benetton team of the power of their new car, the qualifying session in the afternoon did. Nigel Mansell in the Williams proved unbeatable indeed, putting the rest of the field a full second behind. However, alongside him on the grid wasn't the other Williams, as was to be expected. It was Michael Schumacher, who had beaten Ayrton Senna by a whisker, leaving Patrese in fourth. On Saturday morning, only 17 cars went out in free practice as rain had started pouring down in a way that required the drivers to have more swimming skills than driving skills. 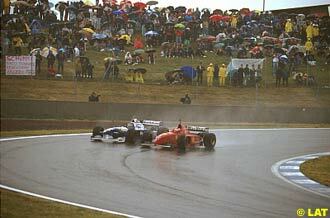 Ferrari driver Jean Alesi showed his mastery in the rain, while Schumacher did things a little more careful in fifth. As the rain kept coming down, qualifying in the afternoon was pretty much useless and all of the Friday times remained unchanged. The rain was still coming down on Sunday morning, and the warm-up was merely a practice in adapting to the wet track. By race time, Mansell showed the rest only spray, while Patrese quickly made his way back to second. As he had shown on Saturday morning, Jean Alesi was a fish in his tub, moving from eighth to third in the first lap, demoting Schumacher to fourth place. 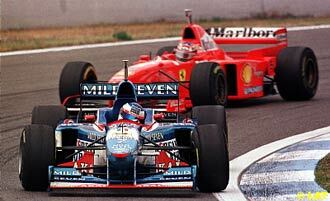 Schumacher passed the Frenchman on lap seven, when Alesi dropped back to fifth after also having to let Senna pass him. Schumacher was promoted once more when Patrese crashed out of second place. The young Benetton driver finished second, with Ayrton Senna behind him. 1993 was Michael Schumacher's first dry race in Spain. The entire weekend was as eventless as it could get for the German. All weekend he ran in fourth behind the Williamses of Damon Hill and Alain Prost and Ayrton Senna's McLaren. This only changed when Hill retired after 40 laps and thus Schumacher finished in third, his second consecutive podium finish in Spain. The next year started out badly, when Schumacher was unable to run in the Friday morning session. This didn't prove a problem, as Schumacher was by far the quickest in qualifying. 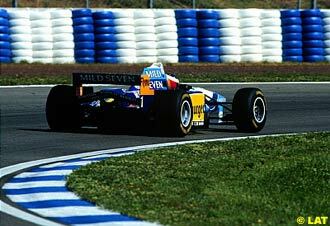 On Saturday, he continued to improve and eventually grabbed pole, ahead of Damon Hill and Mika Hakkinen. On Sunday, Schumacher got off to a good start and opened a lead quickly. After the pitstops, however, he suddenly lost speed; the Benetton had developed a gearbox problem, causing the car to be stuck in fifth gear. Schumacher quickly adapted his driving style and subsequently only had to let Damon Hill ahead of him and helped by late retirements of Hakkinen, Lehto and Brundle behind him, finished an incredible second. In 1995, the first practice session was once again a rainy affair. This time, however, most of the racing was done on dry tarmac and Schumacher once again grabbed pole on Saturday. On Sunday, that was exactly the position Schumacher remained in, from start to finish: Schumacher easily cruised to his first Catalunyan victory. Schumacher switched to Ferrari in 1996 and the season proved a tough task for the Italian team, as the German was battling mechanical problems more often than not. Furthermore, regulation changes meant there was no longer two qualifying sessions, allowing drivers to improve their times from Friday to Saturday. With only one qualifying session on Saturday, the pressure was on every driver to perform well in the single important hour. Schumacher did the best one could expect from him that year and qualified third behind the Williamses of Hill and rookie Jacques Villeneuve. Sunday was to bring a change of fortunes. Not for the first nor last time in his career, it was Schumacher's ally in the form of heavy rain that brought about one of the German's best and most memorable races ever. The start of the race suggested nothing of what was to come, though: both Schumacher and Hill had terrible starts in the wet - Schumacher dropping back to sixth. It wasn't long before he was charging to the front. Schumacher's teammate Eddie Irvine spun out of the race, while the German made his way past Gerhard Berger and Damon Hill, who wasn't at all comfortable in the wet. By lap seven, Schumacher was in third behind Villeneuve and Alesi. In a class of his own, the Ferrari driver lapped one to two seconds a lap quicker than anybody else and quickly made his way past Alesi. Once he passed Villeneuve, Schumacher seemed to add a little more to completely humiliate the competition. In total control, Schumacher lapped four seconds quicker than Villeneuve. When Schumacher made his first stop, after 24 laps, his lead was already 40 seconds. In the end, Villeneuve and Alesi closed in a little bit after Schumacher's engine had started misfiring, but the German finished the race 45 seconds ahead of his followers to claim his second consecutive Spanish victory and his fifth consecutive podium finish. In his second year with Ferrari, Schumacher went into a difficult Spanish Grand Prix after earlier tests at Barcelona had not been successful for the team. Despite only qualifying seventh, he was not unhappy. After a good start and an especially bad start from Heinz-Harald Frentzen in the Williams, Schumacher found himself in second, behind Villeneuve. 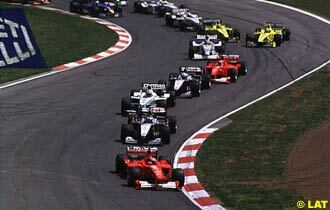 The first series of pitstops then threw him back to sixth place, but as the race progressed, Schumacher moved up. In the end, Ferrari's three-stop strategy proved right and Schumacher finished in fourth - not too bad, all things considered. For 1998 Ferrari and Schumacher went to Spain with the right testing knowledge and didn't mind themselves being outclassed in the first practice sessions. After Friday practice, Schumacher claimed third was the best he could do in qualifying and that's just what he did. The gap of 1.5 seconds to Mika Hakkinen, however, was something to worry about. The race then continued in the same vein. First a bad start and then a ten second penalty for pitlane speeding ruined every chance Schumacher might have had against the McLarens. Which is where the Ferrari showed its power. Despite the problems, the car and driver were powerful enough to claim a third finish nonetheless. In 1999, things went similarly bad for Schumacher and Ferrari. Qualifying was close, with the first five cars covered by a mere three tenths of a second, but for Schumacher it couldn't have been worse. He had three cars ahead of him after having been beaten by both McLarens and his teammate Eddie Irvine. In the race, Irvine quickly dropped behind Schumacher, while Villeneuve had one of his usual lightning starts. Sadly for Schumacher, the starts were about the only thing that went fast with the Canadian. Until the first pitstops, Villeneuve was considerably slowing down Schumacher, but the Ferrari driver was unable to find a way past his old rival. After the pitstops, Schumacher finally came ahead of Villeneuve, but too late to catch Coulthard and Hakkinen. Last year, Schumacher had another twisted weekend in Barcelona. The German dominated throughout the early sessions and was leading the race for the largest part. However, things went wrong at the first pitstop, as the lollipop was lifted in front of him by mistake, making Schumacher leave the pit position prematurely, running over Nigel Stepney, the refueller, who broke his ankle as Schumacher's rear wheel rolled over him. This was not the only affect this pitstop would have on Schumacher's race: as he came in for his second stop, it was discovered that the refuelling nozzle had been damaged in the first stop's accident, and as a result Schumacher's second pitstop took twice as long as rival Hakkinen's. If that left any hope of a win for Schumacher, it all faded when he further suffered a slow puncture. Amazingly, though, the German stayed out on the track to make the best of it and in a classic manoeuvre wheelbanged with his brother Ralf in the Williams, in order to help teammate Rubens Barrichello to gain a place. The move was successful and left Ralf less than pleased. Schumacher himself eventually ended his troubled race in fifth, grabbing two valuable points.